Sluggers 14u representing big for their high school teams. Great work ladies! 16u Elite with the tournament win at LSSC City Wide Sell Out! 16u Eilte wins the Holiday Inn Express Classic! 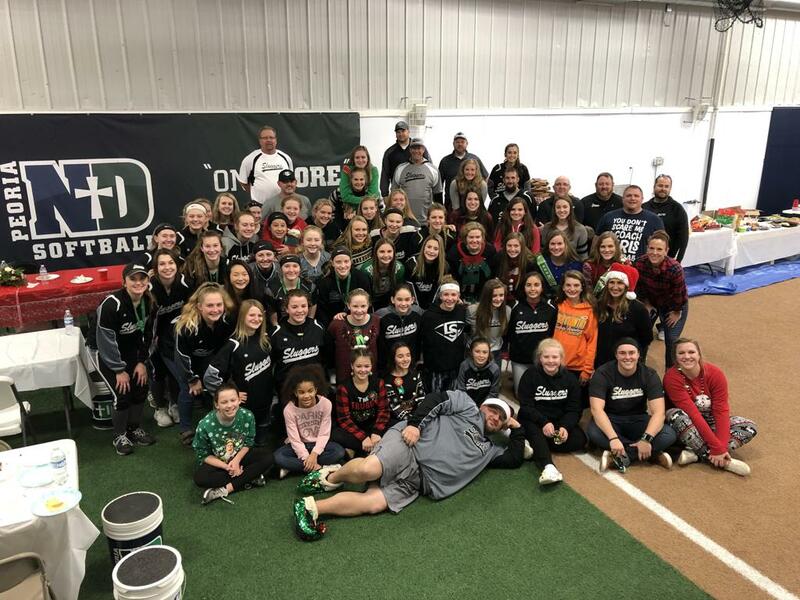 Sluggers teams Christmas Party! Everyone had a great time, it was great getting all the teams together. If you want to see more pictures, please go to the about tab then to photos to see our gallery! Thank you to everyone who made this night a success. Congratulations to our 14u Elite for winning the Avanti Dome USA Softball Tournament! Congratulations to Sarah Lahood on her commitment to Monmouth College for softball and volleyball. We are very proud of you! Great moment with our 14u Elite and 14u teams, teams played each other in the semi-final round at the USA ASA Pitch for the Cure Tournament. Louisville Sluggers is proud to have players that come from different areas of Illinois. We are continuing to stretch further out from the Peoria area! Louisville Sluggers is proud to have players that come from all different areas of Illinois. We are continuing to stretch further out from the Peoria area! Peoria Sluggers goal is to provide the highest level of competition for our motivated and talented softball players. Peoria Sluggers is a fast-pitch softball organization that will travel throughout the country to play the best competition possible! These teams will play in ASA, USSSA, USA Elite Select, PGF, Triple Crown sanctioned tournaments plus the best College Exposure tournaments in the country! We expect our teams to qualify and participate every year in either USSSA Nationals, PGF Nationals or an ASA Nationals. The major focus for our 14U - 18U coaches is College recruiting for our players. Peoria Sluggers teams will work hard to win games, but winning will never become more important than sportsmanship and teamwork. Ultimately, the development of skills and team focused play will be the guideline for our program, which we believe will create better players and better people. Peoria Sluggers Fast-Pitch Organization is based out of the Louisville Slugger Sports Complex in Peoria, Illinois. Each hotel is dedicated to surpassing all guests’ expectations of comfort, convenience and quality by providing outstanding properties and superior customer service to meet the needs of every traveler. ©2019 Peoria Sluggers Fastpitch / SportsEngine. All Rights Reserved.